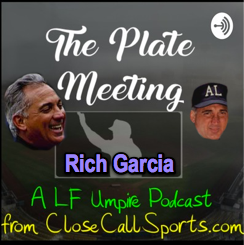 We're pleased to announce our upcoming Plate Meeting podcast here at CloseCallSports.com with guest Rich Garcia, a 25-year AL umpire veteran with 3,398 regular season games, 104 ejections, three Division Series, five League Championship Series, and four World Series to his name. Submit your questions here at CloseCallSports.com or, if you have the Achor.fm mobile app, you can send us a voice message via our Plate Meeting podcast profile. Garcia began his professional career in the 1970 Florida State League, working his way through the Southern and International Leagues before his 1975 American League debut. Ejecting Billy Martin just three games into his major league career, Garcia went toe-to-toe with the likes of Earl Weaver, Whitey Herzog, Tony LaRussa, Bobby Cox, Lou Piniella, and Joe Torre before stepping off the field in 1999. To subscribe to The Plate Meeting, visit our Anchor.fm page, which offers external links to popular podcast providers, such as Apple Podcasts/iTunes, Spotify, Radio Public, and Google Podcasts.